The guide cut the engine and the Land Rover coasted quickly to a stop in the thick red dust that masks our view of the the forest. In front of us sat one of the most grotesque images I had seen since coming to Africa. In every direction it seemed to be clawing its way toward the heavens, and it appeared to be nearly as broad as it was high. 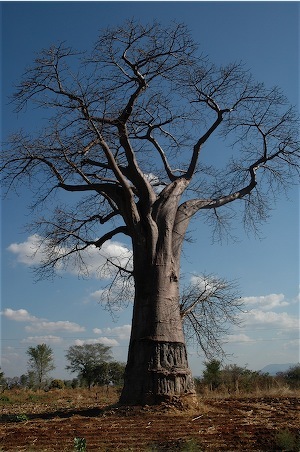 It was one of the old ones, one of the Baobab trees that inhabit this part of Africa. I had read story after story about them, and fable after fable. I did not know I was about to hear another of those tall stories (no pun intended) about this famous tree. But first a little more background might be in order for those who live in parts of the world where this tree has never traveled. In many villages the baobab tree is a center for community life. Meetings take place under its broad branches, and in places it is the source of many religious beliefs and rites. The nation of Senegal has selected the baobab to be its national symbol. One African proverb from the nation of Ghana offers this favorable evaluation, “Knowledge is like a Baobab tree, one person’s arms cannot encompass it.” However not every conclusion about the tree is quite this complimentary. Many fables revolve around the tree. One of them is drawn from its strange appearance. The leaves appear to be under the ground and the roots seem to be what is sticking up in the air. Because of this upside down appearance the story concludes it is an act of the gods. So the story goes it’s upside down appearance comes because of its arrogance with the other trees around it. This caused the other trees to be sad and the gods who planted them became angry and pulled the baobab tree up and then shoved it back in the ground upside down. In parts of Tanzania the village people believe the trees contain the souls of former chiefs or tribal leaders. Not to be outdone by the other cultures our guide launches into yet another tall tale concerning the appearance of the baobab tree. As the story goes when God created the earth the animals came to him and asked if they could be participants in the remaining portion of the creation. Since He was nearly done he advised them that the only thing remaining was to create the trees. The animals were excited because they could participate in this work. They asked God to let them plant the seeds for the trees. God reluctantly agreed. He then started giving out seed, one particular seed to one particular group of animals. Another group of seeds to another group, and on and on until He got to the last seeds and the last animals. It was the seeds for the baobab trees that remained and the only animal left were the hyenas. “Now everyone knows how stupid the hyena is,” he observed. With that he turned the key, the diesel engine sprang to life, and we drove past the giant tree that may have been listening to every word!